Be the first to share your favorite memory, photo or story of Rory. This memorial page is dedicated for family, friends and future generations to celebrate the life of their loved one. 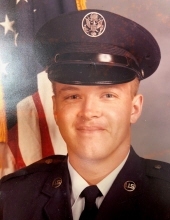 Rory Dale “Rocky” Harmon, age 59, of Farragut passed away suddenly Friday, October 19, 2018 at his home. Rocky was a member of Virtue Presbyterian Church. He was a veteran of the U.S. Air Force. He was a prominent 4 sport athlete at Farragut High School. Rocky went to Carson-Newman on Track and Football scholarships. Rocky was a dedicated son who cared for his mother until her death earlier this year. He was preceded in death by his parents, Charles “Charlie” Harmon and Mary Ellen “Mert” Harmon. Rocky is survived by his aunts, Joan Fields, Betty Akers and Margaret Duty; several loving cousins; special friends, Jay Beeler, Susie Horne, and Angie Wolf Sanders; and many life-long friends. Entombment will follow with full military honors conferred by East Tennessee Veterans Honor Guard. Honorary pallbearers are Jay Beeler, Matt McFee, Joe Price, Steve Welch, Rick Stone, Mike Neff, Danny Lovell, Phil Coker, Roger Clearman, Rob Myers, and Jeff Myers. In lieu of flowers, memorials may be made to the Mary Ellen “Mert” Harmon memorial fund c/o CPWM Day Circle at Virtue Cumberland Presbyterian Church, 725 Virtue Road, Knoxville, TN 37934. Click Funeral Home Farragut Chapel, 11915 Kingston Pike is serving the Harmon family. To send flowers or a remembrance gift to the family of Rory Dale "Rocky" Harmon, please visit our Tribute Store. "Email Address" would like to share the life celebration of Rory Dale "Rocky" Harmon. Click on the "link" to go to share a favorite memory or leave a condolence message for the family.